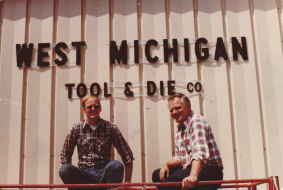 1977 West Michigan Tool & Die founded by partners Clarion “Swede” Carlson, and Jerry Jackson, building first tooling for Rockwell International. 1980 Moved into a new 4,000 square foot manufacturing facility. 1985 Built four die packages of tooling for starter housing for Cadillac’s Northstar platform, became sole supplier of die cast tooling for Milwaukee Power Tools sourced domestically. 1986 Doubled the production floor space of manufacturing facility. 1993 Current President, Steve Jackson was hired as Purchasing Manager. 1996 ARK Industrial Machining lathe division was established by Steve Jackson, employment reaches a high of 24 toolmakers, machinists, and designers, and managers. 2001 New 5,000 square foot facility was built for the custom machining lathe division, ARK Industrial Machining. 2003 Jerry Jackson retires and Steve Jackson purchases West Michigan Tool & Die, becoming President. That same year Fred Layton is hired as Sale Manager and establishes the production intent prototype business line with Trelleborg Automotive, a Tier I automotive supplier of engine and power train mounts. 2007-2011 General Motors contracts with WMTD to develop and prototype mount brackets for the hydrogen fuel cell vehicles and the cooling laminations for the Volt Lithium Ion Battery packs. 2016 Addition of 1,600 square foot offices including conference center and quality lab. 2018 Expanded high volume production machining in response to market needs; Achieved minority business enterprise certification through the Michigan Minority Supplier Development Council to meet client’s supplier diversity strategies.